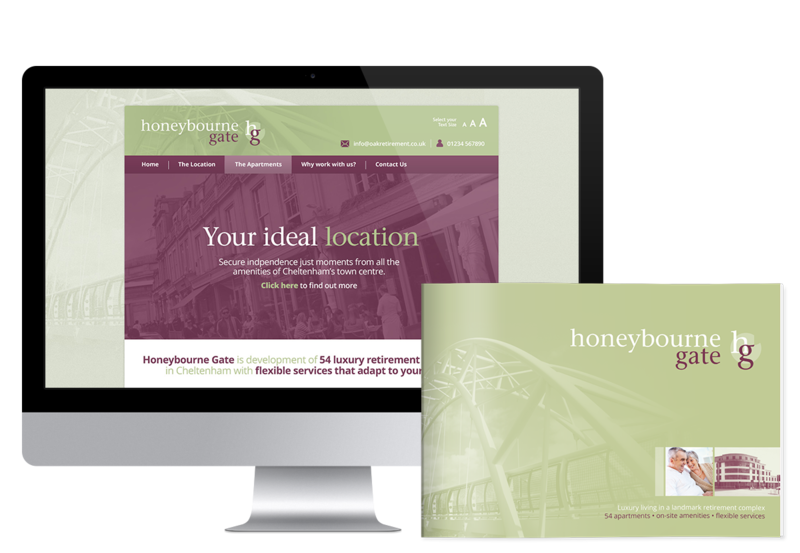 Honeybourne Gate is a development of 54 luxury retirement apartments in Cheltenham. Oak Retirement Ltd and Markey Group are two companies working together to deliver high quality, leasehold, Extra Care property for older people to enjoy independent living. 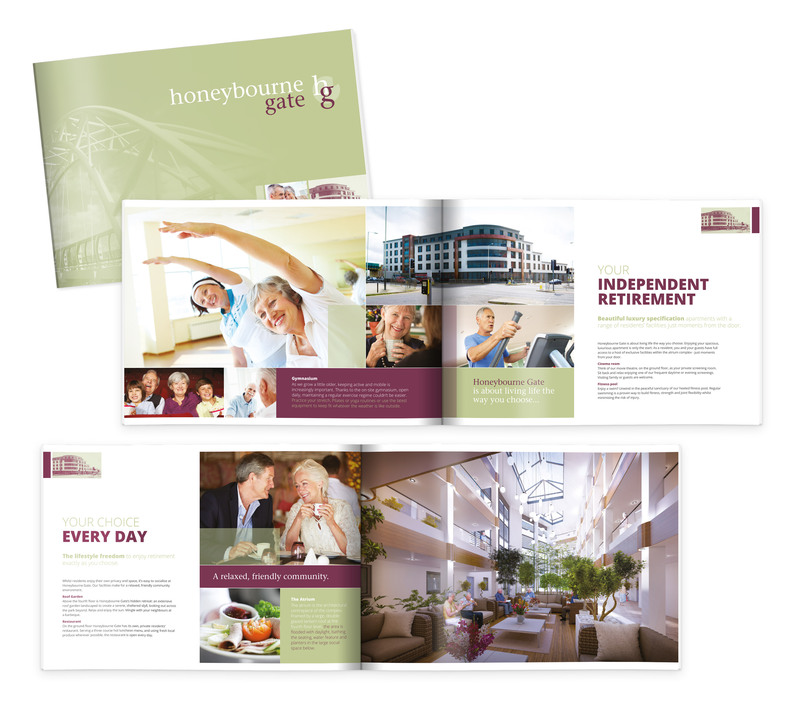 We were recommended to Oak Retirement and the Markey Group to develop marketing materials for this high profile scheme. The market for retirement developments in Cheltenham is a crowded one, so it needed to stand out. 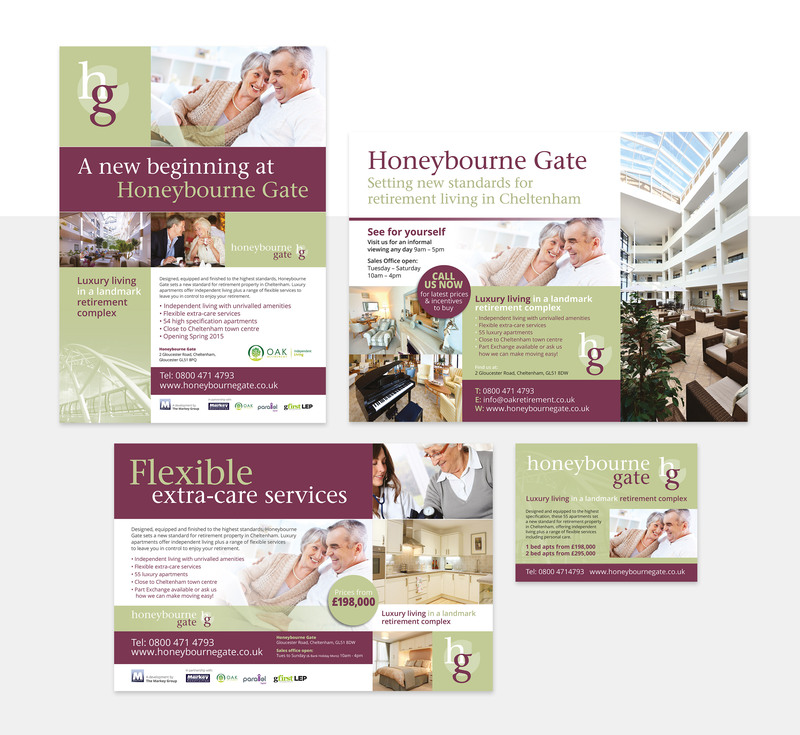 As an extra care facility, the identity and marketing materials needed to reflect the luxury nature of this development. We created an identity to promote the scheme, facilities and lifestyle, which was rolled out across various media throughout the course of the build and sales process. Starting with the identity to dress the hoarding around the site, right through to the site point-of-sale items for the marketing suite and open days. With its own direct access onto the pathway that runs along the old Honeybourne railway line, the name was derived from this well known landmark. We also used the new Honeybourne bridge as a key feature in the identity created to promote the scheme, the facilities and the independent living offered only minutes from the town centre. As the site is positioned at a prominent junction near the town centre, the hoarding around the site was a key promotional opportunity at the early stages of the construction. With a run of 68 panels along two sides of the development, this space was utilised to raise awareness to passing traffic and footfall. The main brochure was produced to present the full details of what was on offer, which was then complemented by individual floor plans inserts for each apartment. A folder was also produced to carry these items, which was given out to potential purchasers. 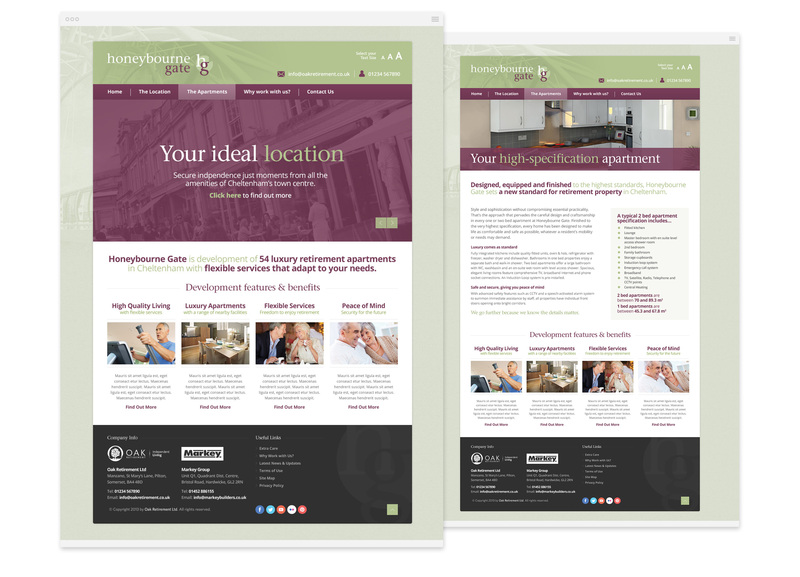 A simple responsive website was built to promote the development. The website was initially used to gather details from interested parties, as soon as the hoarding went up. Further information was soon added to explain the nature of an extra care facility and full details of the development, the apartments and benefits of the location. Supporting items were produced during the sales programme, from launch adverts through to point-of-sale items for open days and to dress the marketing suite. Lines gave us great ideas and good advice. They were flexible and helpful and we are very pleased with the outcome.